We would be pleased to provide you with a callback during our business hours: 9:00-17:00 Mon-Fri.
"Video clip of ingress of soil through a hole in a severely corroded concrete sewer"
"CCTV Conduit Condition Inspections - The importance of training operators and the client"
"The course tripled my knowledge of CCTV inspection of conduits and identification of defects"
"I liked the whole course"
"In depth view of both CCTV operators and supervisors roles"
How would you code these defects/features? We provide specialised training and assessment for the water industry across Australia in accordance with the National Water Training Package NWP07. We also provide a consultancy in training needs identification, development of work practices and industry standards, development of specifications and auditing of work practices in relation to standards and codes. 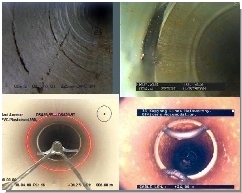 Internal inspection of underground assets such as sewers, stormwater pipes and culverts, using specialised closed circuit television (CCTV) systems, provides asset owners with important information on the condition of these assets. The Conduit Inspection Reporting Code of Australia WSA05, published by the Water Services Association of Australia(WSAA), provides a standard for the inspection and reporting on the condition of sewers and stormwater drains. Two versions of the Code are available. WSA05-2008 is used by most agencies with WSA05-2013 specified by a significant number. Training of operators, supervisors and managers involved in aspects of the inspection and reporting on the condition of assets in accordance with the Code is critical for effective management of essential sewerage and drainage infrastructure. Two versions of the Code are available. WSA05-2008 is used by most agencies with the later version WSA05-2013 also specified by a significant number of asset owners. Training of operators, supervisors and managers involved in aspects of the inspection and reporting on the condition of assets in accordance with the appropriate Code is critical for effective management of essential sewerage and drainage infrastructure.